Nancy Pearl Unearths Great Summer Reads For Nancy Pearl, beach reading doesn't mean light reading. 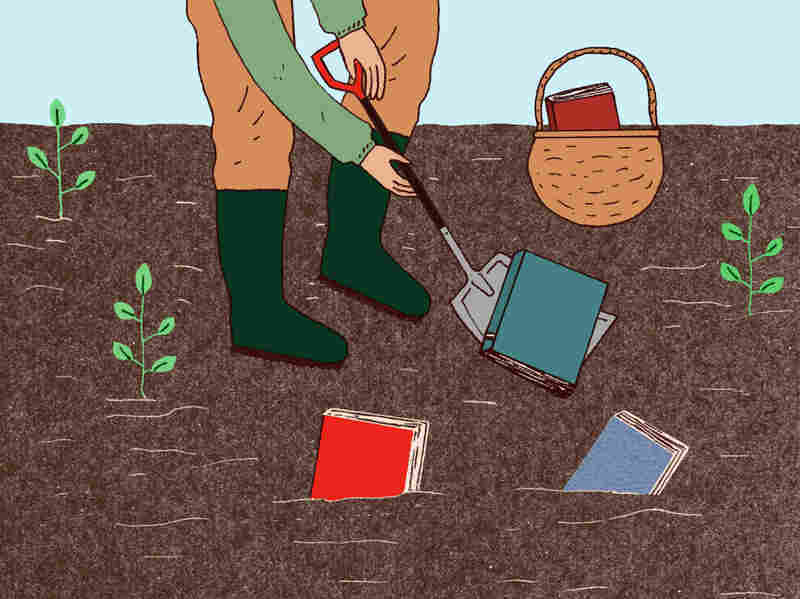 NPR's go-to librarian has dug up a diverse mix of titles old and new — a selection of mystery, memoir and more. So here's a diverse selection of books I've enjoyed recently, including two mysteries; a reprint of a book long out of print; a beautifully written, emotionally resonant memoir; and a moving and important novel about a group of American soldiers, survivors of a firefight in Iraq, back in the United States for a victory tour. I hope you'll find at least one that sounds good to you. I know that the first two letters of "memoir" spell "me," but the kind of memoir I like best is one that goes beyond being simply a personal account and instead tells a larger story. The Map of My Dead Pilots by Colleen Mondor does exactly that. From 1993 to 1997 the author worked as the dispatch coordinator for an air transport company headquartered in Fairbanks, Alaska. This isn't a neatly narrated, chronological account with a clean beginning and a clear end. Rather, in lyrical, impressionistic prose she relates the stories she tells of the pilots she knew — some still living and some now dead — to the myth and the reality of Alaska. It's a story of danger, of loss, of courage, of unsavory landing strips and forbidding mountains, of delivering mail and making mercy flights, of adrenaline and prayer, of unpredictably changeable winds and oncoming storms, of snow, of difficult decisions, of good fortune and bad luck, and, always, of the unbelievable cold. But it's also about why we choose the lives we do, how we rewrite our pasts to make sense of ourselves to the person we've become, what we choose to remember, and how and why we forget what we do: It's about myth-making, storytelling and memory. Mondor says: "If I remember the stories, then I know the life I lived was true; I know it happened; I know that once upon a time this was who we were and how we lived." Joshua Bland was born and raised in a small Iowa town where, unloved by his mother and stepfather, he grew up with a lacerating self-hatred. Once acclaimed as a child prodigy, he has always believed that he was never quite smart enough. Throughout his life, Joshua has systematically destroyed whatever happiness could be his, knowing exactly what he was doing as he did it, but unable to stop himself. While A Gay and Melancholy Sound is certainly grounded in the great historical events of the mid-20th century — World War II and McCarthyism, to name two — Miller's novel never feels dated or awkward: There's no strong whiff of the long-dead past emanating from its pages. Indeed, there's enough snark, emotional pain and irony to satisfy even the most demanding 21st-century reader. I think that I could probably subsist on a reading diet of first novels. Finding a new writer whose work I love reassures me that the end of storytelling is nowhere near. I felt this way recently when I encountered Jennifer DuBois' Partial History of Lost Causes on the shelves of my local book store. Two people find their lives intersecting: a former chess prodigy who decides to challenge Vladimir Putin for the Russian presidency and an American woman in her 20s who knows her life is going to be cut short by Huntington's disease. We are first introduced to Aleksandr Bezetov in 1979, when he arrives in what was then Leningrad to attend a chess academy. We meet Irina Ellison in 2006, shortly after her father's difficult death from the genetic disease that will likely kill her, too. When she discovers in her father's papers an old (and apparently unanswered) letter from her father to Bezetov asking him how he copes with those games he knows he's going to lose, she decides on the spur of the moment to go to Russia and see if she can confront Bezetov and have him answer her father's question. I can't remember reading another novel — at least not recently — that's both incredibly intelligent and also emotionally engaging. I really cared about Irina and Bezetov: Their attempts to outrun (or at least accept) their individual fates was both moving and tragically real. Ben Fountain's Billy Lynn's Long Halftime Walk is a brilliantly conceived first novel that takes place over the course of one day. It's the story of 19-year-old Billy Lynn, a member of Bravo Squad, a group of soldiers who, fresh from winning a firefight in Iraq that's made them media darlings, are brought back to the U.S. for two weeks for a "victory tour" that's intended to drum up support for the war. (Dime, their cynical sergeant, points out that they're being sent only to the swing states.) They're spending Thanksgiving Day at the Dallas Cowboys football game, and at halftime Bravo Squad is going to walk to the center of the football field and meet Beyonce and the rest of Destiny's Child. The irony, sorrow, anger and examples of cognitive dissonance that suffuse this novel make it one of the most moving and remarkable novels I've ever read. ... the Bravos speak from the high ground of experience. They are authentic. They are the Real. They have dealt much death and received much death and smelled it and held it and slopped through it in their boots, had it spattered on their clothes and tasted it in their mouths. That is their advantage, and given the masculine standard America has set for itself it is interesting how few actually qualify. Why we fight, yo, who is this we? Here in the chicken-hawk nation of blowhards and bluffers, Bravo always has the ace of blood up its sleeve. C.J. Sansom's Dissolution is the first in a series of historical mysteries set in Tudor England during the reign of Henry VIII. In 1537, England has been sundered in two by religion: There are those who have gone along with Henry's decision to dissolve the monasteries and institute the Church of England, and those who are still loyal to the Catholic Church, overseen by the pope in Rome. The main character of this series is a hunchbacked lawyer named Matthew Shardlake. He is one of the reformers, as the followers of the king's new religion are called. His fellow reformer (and Henry's loyal servant), Thomas Cromwell, asks (or rather, orders) Matthew to undertake an investigation into the death of a royal commissioner that occurred in a monastery scheduled to be destroyed, located on the south coast of England. Sansom does a remarkably fine job of bringing the period and its larger-than-life characters (many real, some, like Shardlake, imagined) to life. I've always felt that the best way to get a feel for any particular historical period is to read a novel that takes place then, and Sansom doesn't disappoint. We're given the sights, sounds, smells and very atmosphere of the 16th century. Indeed, the time and place are as much characters here as any of the two-legged men and (very few) women who people the pages of Dissolution and the four novels that follow it. The major elements that make up the mysteries I greatly enjoy include nice writing and a flawed but appealing hero trying to get to the bottom of a complex plot. If the mystery has its roots in the past, well before the book opens, that's the frosting on the cake for me. Michael Robotham's Lost is a match for all my criteria: The story involves a 7-year-old girl gone missing three years ago and now presumed dead, a man convicted of the crime, and a present-day shootout on the Thames that leaves a cop hospitalized and suffering from amnesia. Detective Inspector Vincent Ruiz, the victim of the shootout and the only person on the police force who believes that the little girl is still alive, thinks that the two cases are related, but he can't remember enough to make sense of either one. With the help of his psychologist friend Joe O'Loughlin, Vincent works through the thick fog of his memories to solve (or resolve) both cases. This is the second of Robotham's mysteries in which O'Loughlin plays a major role; I wouldn't mind reading a lot more books featuring Vincent. The discussion of A Gay and Melancholy Sound in an earlier version of this Web story mentioned that it is part of the Book Lust Rediscoveries series, published by Amazon, but did not clarify that Nancy Pearl edits the series and has a business relationship with Amazon.